The JuiceBox ™ 40 is probably the most powerful basic charging package from Electric Motor Werks, Inc. The JuiceBox 40 electric car charging station is a smart Wi-Fi connected 10KW/ 40A EVSA car charging station. It gives the user a very smooth charging experience. It is almost trouble free and a smart choice to charge your cars with. The JuiceBox 40 electric car charging station costs $499.00 and is a great value for money product. This JuiceBox 40 gives more power than any other product in its price range. It is compatible with any power source. It can plug into a dryer, RV-type or a regular wall outlet with adapters. Easy installation with any simple NEMA 14- 50R outlet. 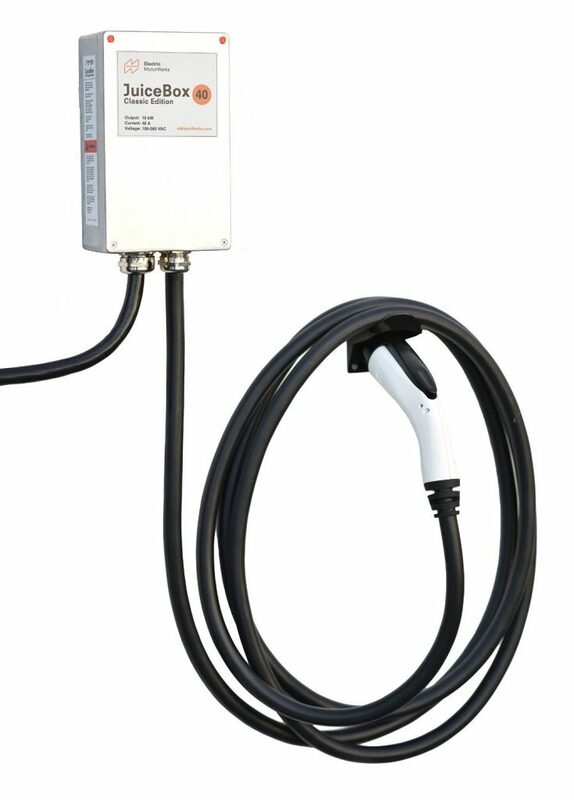 The JuiceBox 40A EV Charger comes with a 40-amp 24-foot J1772 charging cable. Smallest EVSE of its range in the market. High-power, 40A, 10kW Level 2 EV charging station. Indoor / outdoor installation. Cable management mount included. UL listed. Energy Star certified. Portable: Can be removed from the mounting bracket in seconds and used on the go. Built in USA. Compatible with all EV models and automatically adjusts to provide just as much power as your EV is able to accept, up to 40 amps. Ideal for home and apartment-dwelling EV drivers who need a charging station powerful enough to quickly recharge between trips at home and are looking to control charging times to avoid peak electric rates. Can be used with any power source: plugs into a dryer, RV-type or regular wall outlet with available adapters. Just install a simple 14-50R outlet and you're ready to plug in your JuiceBox. Alternate hardwired JuiceBox Pro 40 option is available on eMotorWerks' website. The product comes with Energy, Voltage and Current measurements with 0.2 % precision. It has an advanced energy metering. It has persistent storage of energy data, wherein the data is stored even when power is disrupted. The JuiceBox 40 has a set of advanced safety and compliance features. The charging station has a charging interlock. It comes with temperature monitoring and power detection. There is a Wi-Fi accessibility feature too. The JuiceBox 40 is indoor and outdoor rated. It comes with a sturdy aluminium IP66 UL rated enclosure. Some advantages of the JuiceBox 40 A EV Charger: The JuiceBox 40 A EV is solid yet portable. You can charge it even on the move. It is durable and adaptable and easy to install. The pricing is one among the best in its category. Some of the instructions are self-contradictory and does not have extra features. But, these are simple drawbacks and can easily be overlooked. The JuiceBox 40 A EV seems to have an edge over Chargepoint Charging stations because the former is definitely powerful than the latter by a remarkable margin. Though the Chargepoint charging station starts at $499, the JuiceBox 40 at the same price range has better features like easy portability to its credit. The charging station Tesla is a network set-up by Tesla motors to facilitate long journeys of their electric cars and vehicles through quick 480-volts charging. At a whopping 705 stations with 4,359 chargers it is a market leader. The small but powerful and portable JuiceBox 40 comes handy where a charging station Tesla is not available around. The level 3 charging stations are fast charging stations which ensure quick charging in a short period of time. The level 2 chargers are generally used in residences, whereas the level 3 chargers are used in commercial and business establishments. 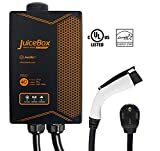 Well, the JuiceBox 40 A EV charger can be your quintessential charger which does the same job as the level 3 charging station at a lesser price. 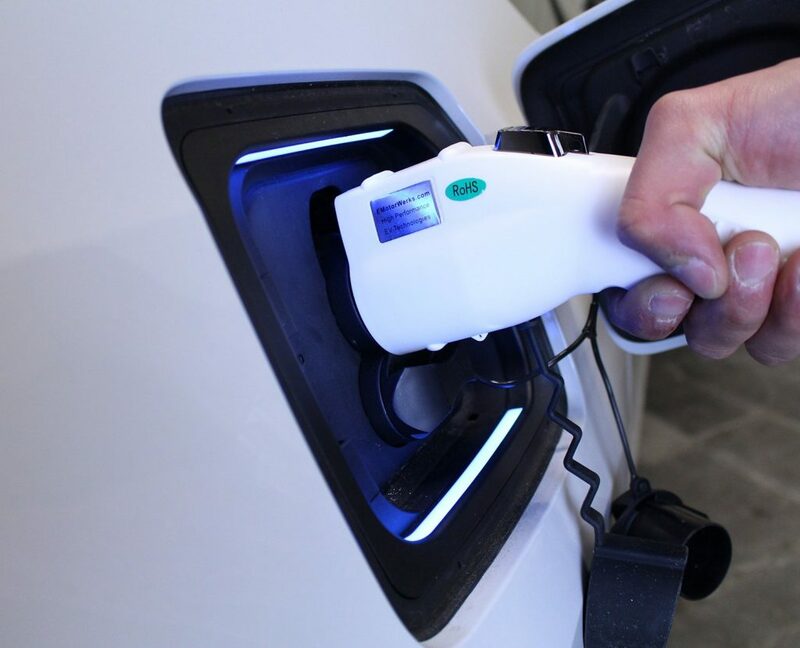 The level 3 charging stations are not compatible for some vehicles whereas the JuiceBox 40 A EV can be checked for vehicle compatibility and can provide a full battery charge in your home or even when you are on the move. The level 2 charging stations require minor installation of charging equipment. A public level 2 charging station may take 4-6 hours of charging a drained battery and this could be inconvenient when you are travelling. Therefore, most prefer to own a compatible level 2 charging station such as the JuiceBox 40. The JuiceBox 40 is not heavy and overpriced like many other charging stations. It comes highly recommended by customers who vouch for its portability, solid quality, durability, reliability and compatibility. It is convenient and easy to install. It is small but powerful and is competitively priced and this is why it doesn’t get better than this. The JuiceBox 40 has implemented a standard protocol of all EV charging station manufacturers and easily figures among the top ten charging stations in the current year list.